UP9000 Ultraprobe 9000 Digital Ultrasonic Inspection Tool Reliability Direct, Inc. Your Direct Source for Reliability, Maintenance, Test & Measurement! The Ultraprobe 9000KT Complete Kit is a digital ultrasonic inspection, information storage and retrieval system that is so versatile, so easy (most operators are able to use the Ultraprobe 9000 within 15 minutes) and so much fun to operate, you'll be looking for opportunities to use it every day. From the very instant you hold the Ultraprobe 9000 Ultrasonic Inspection System in your hand, the feel of the well balanced pistol grip, the elegance of simplicity and the clarity of signal will convince you that this is truly a remarkable feat of engineering. This Ultraprobe is ready to unleash the potential of any inspection program. 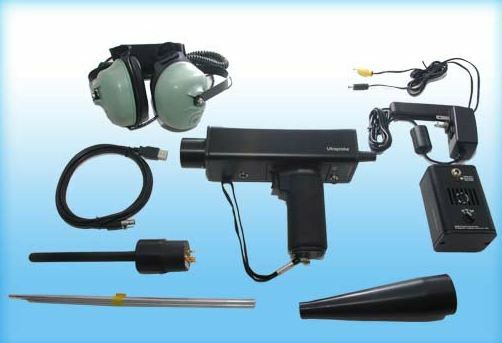 This heavy duty headset is designed to block out intense sounds (over 23 dB of noise attenuation) often found in industrial environments so that the user may easily hear the sounds received by the ULTRAPROBE 9000. The Warble Tone Generator is used to provide a sensitivity validation (Calibration) test. It is also used as an ultrasonic transmitter designed to flood an area with ultrasound as part of a leak test. When placed in an empty container, it will flood that area with an intense ultrasound that will flow through a leak hole. The Rubber Focusing Probe is a cone shaped rubber shield. It is used to block out stray ultrasound and to assist in narrowing the field of reception of the "Trisonic" Scanning Module. This module receives air-borne ultrasounds such as those emitted by pressure/vacuum leaks and electrical discharges. The Trisonic Scanning Module has a phased array of three piezoelectric transducers which focuses the ultrasound on one "hot spot" for directionality and effectively intensifies the signal so that minute ultrasonic emissions can be detected. This module has a metal rod that acts as a "waveguide". 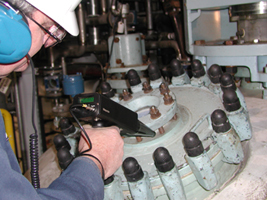 It is sensitive to ultrasound that is generated internally such as within a pipe, bearing housing or steam trap. Once stimulated by ultrasound, it transfers the signal to a piezoelectric transducer located directly in the module housing. It is "module shielded" to provide protection from stray RF waves that have a tendency to effect electronic receiving and measurement. It is equipped with low noise amplification to allow for a clear, intelligible signal. This consists of three metal rods that will enable a user to reach up to 31 additional inches (78.7 cm) with the Stethoscope Probe. The Pistol Grip Housing is the main control unit. It consists of the display panel, the "Spin & Click" controls for volume/frequency adjustment, data entry and data storage, the headphone jack, battery, I/O port, trigger on/off switch and module receptacle. Now you can test in hazardous environments with the Ultraprobe 9000IS. Rated Intrinsically Safe, for use in Class I, Division 1, Groups C & D by both Factory Mutual and CSA. With this rating, users can assuredly enter environments such as ethylene and propane without risking an explosion or fire (as long as plant safety procedures are followed). 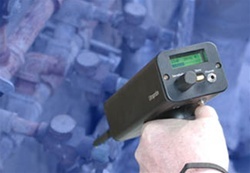 The Ultraprobe 9000IS is a digital instrument with on-board data logging and frequency tuning features that enable inspectors to identify sources of potential mechanical failure, electric faults and leakage in plants. With uploading and downloading capability, the Ultraprobe 9000IS interfaces with UE Systems Ultratrend DMS data management software. This powerful program records test data, organizes reports, produces trend charts, sets alarm groups and links with UE Systems Compressed Gas Software which reports leak surveys in terms of energy dollars saved and carbon footprint impact. The Ultraprobe 9000 ATEX lets you test in hazardous environments. With the ATEX Rated EEx ib IIB Gb Ultraprobe 9000, users can assuredly enter environments such as ethylene and propane without risking an explosion or fire (as long as plant safety procedures are followed). As with other Ultraprobe 9000 models, the digital Ultraprobe 9000 ATEX features on-board data logging and frequency tuning that help inspectors identify sources of potential mechanical failure, electric faults and leakage in plants. Uploading and downloading capability via a USB connection interfaces the Ultraprobe 9000 ATEX with UE Systems Ultratrend DMS data management software. This powerful program records test data, organizes reports, produces trend charts and sets alarm groups. Ultratrend DMS also links with UE Systems Compressed Gas Software which reports leak survey cost avoidance and details the reduction of carbon footprint gases related to the leak repairs. Headset: Deluxe noise attenuating headphones. Over 23 dB of noise attenuation. Meets or exceeds ANSI specifications and OSHA standards.